The fun and excitement of Adventurethon Stage Racing is heading to Dwellingup in 2019. Family fun + excitement + extraordinary locations + adventurous challenges are all on offer to you. Ride, Run (or walk) and paddle your way through some of the best locations in the beautiful Dwellingup region of Western Australia. This event will showcase some of the best and most unique scenery that the region has to offer. NEWS! TREES ADVENTURE high ropes obstacle added to end of Long Course Run! Start your weekend of fun, thrills and adventure with a paddle down the picturesque Murray River. Follow your paddle with an exhilarating run through the jarrah trees along the Lane Poole Reserve tracks. Look out for the ‘King” jarrah along your way and enjoy the riverside scenery. Be prepared for some challenges along the way to spice up your run. Wake Sunday to some mountain biking fun at the popular Marinnnup Loop. Here you can experience truly unique scenery of the area as you tackle this superb cross country course and its associated trails. 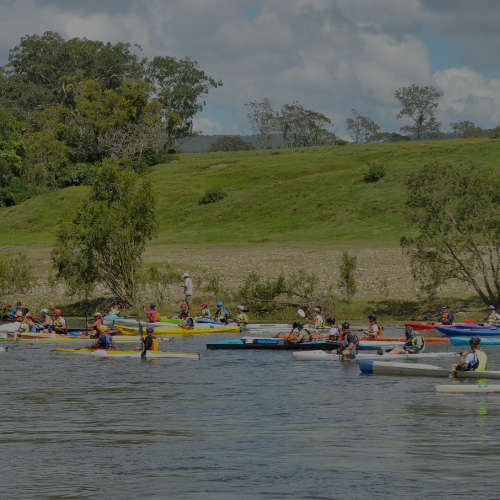 Welcome to the Murray River Downhill paddle – Adventurethon Demolish Dwellingup – Stage 1. Paddle the picturesque Murray River from your starting point to our finish line at Baden Powell water spout. These downriver courses are very scenic but don’t let that distract you from the numerous small challenges you might face between the start and finish. Appropriate river flow for safe paddling without too much portage is not guaranteed. If river levels are unsuitable or unsafe alternate paddle courses between Pinjarra and Ravenswood will be used for the event (Ultra – Pinjarra to Ravenswood; Enduro – George Brooks Reserve to Ravenswood; Taste/Junior – two kilometre loop through Ravenswood. Registrations: Registration is online only. Registrations close 9:00 pm Thursday 23rd May or when sold out. Beginners and Juniors can choose to challenge themselves at the beginner friendly Taste or Junior distance, not as challenging as the Ultra or Enduro paddles but no less fun. More adventurous paddlers looking for a little more adventure might opt to undertake the Enduro event, a longer distance with a few small rapids to negotiate. For the real adventurer, and most fun, the Ultra is your option; not a long course by Adventurethon standards but plenty of fun. Paddle craft that can navigate easy rapids and shallow sections: kayak, SUP, Ski, outrigger, K1, etc., are suitable for this event as long as they have some buoyancy (EG FOAM or be a sealed unit like a ski). We recommend beginners use plastic skis to allow you to bounce off rocks if you stuff up. Flip up rudders are definitely recommended for 99% of people to avoid rudder damage. From the Stringers the course is pretty simple, just point the bow downstream and follow behind. Along the way immerse yourself in the views and wildlife along the banks, try to avoid the occasional swimmer and enjoy your journey to Baden Powell water spout. Don’t relax so much that you forget to navigate though because there will be different line options as you head downstream and through the rapids. From Island Pool the course is pretty simple, just point the bow downstream and follow behind. Along the way immerse yourself in the views and wildlife along the banks, try to avoid the occasional swimmer and enjoy your journey to Baden Powell water spout. Don’t relax so much that you forget to navigate though because there will be different line options as you head downstream and through some small rapids. A real fun, beginner friendly, spectator friendly option. Paddle an out and back course in the quiet pool at Baden Powell to reach your finish line. Along the way immerse yourself in the views and wildlife along the banks, try to avoid the occasional swimmer and enjoy your journey. Challenge your friends to have a go and take time out to give them a good splashing along the way! Welcome to the King Jarrah Adventure Run – Adventurethon Demolish Dwellingup – Stage 2. Lane Poole Reserve provides a perfect setting for your adventure trail run with the 250 year old king jarrah right beside the circular trail which also follows the scenic Murray River. Race Pack Pickup: Friday 24th May; Dwellingup (location TBA) or at least 1/2hr before each stage race. Adventurethon Demolish brings together a range of run distances to suit everyone from first timer to seasoned veteran. Beginners and Juniors can choose to challenge themselves at the shorter and less technical Taste or Junior distance. More adventurous runners looking for a little more adventure might opt to undertake the Enduro event, a longer and more difficult course. For the real adventurer, and greatest fun, the Ultra is your option. For some participants this will be the first of three stages as they attempt to complete the Ultimate Adventurethon Demolish. Others will take a more leisurely approach and perhaps only tackle the run stage before heading off to spectate at the other events and get their kicks that way. Whatever approach you take we guarantee you will have a blast. You won’t get bored as you traverse different terrains on these courses. The Ultra course winds its way around the old logging tracks of Lane Poole Reserve to take you past the best scenery in the reserve. This course is technical in places but also has sections of fire road. The course takes you on a tour around King Jarrah walking trail so you won’t miss any interesting sights including ‘King Jarrah’. The race starts and finishes at the Trees Adventure Park so be prepared for a mystery challenge before you complete the run, just to keep things interesting and to raise your adrenalin levels. We have earmarked two courses for the Ultra run, one 23 km and one 18 km. Final decisions about course choice will be made shortly before the event to ensure the safety of all competitors on race day. Sorry people, looks like you will have to train for 23 km but on the bright side you should be able to smash 18 km after that training!! The most likely option is 23 km and the race will only be shortened if competitor safety becomes an issue on the longer course. The Enduro course takes you along parts of the Lane Poole and King Jarrah walking tracks, but unlike the Ultra it does not include the complete loop. This course uses old logging tracks to link the two major tracks. Scenery along these tracks is spectacular and this course is technical in places but also has sections of fire road. The race starts and finishes at the Trees Adventure Park so be prepared for a mystery challenge before you complete the run, just to keep things interesting. The Taste/Junior course provides everyone with an exciting but easy option. This course on easy trails allows you to take in the experience of the location without needing to put your life on hold to train. This course uses old logging tracks to provide wonderful scenery. The race starts and finishes at the Trees Adventure Park so be prepared for a mystery challenge before you complete the run, just to keep things interesting. Welcome to the Marrinup MTB XC – Adventurethon Demolish Dwellingup – Stage 3. 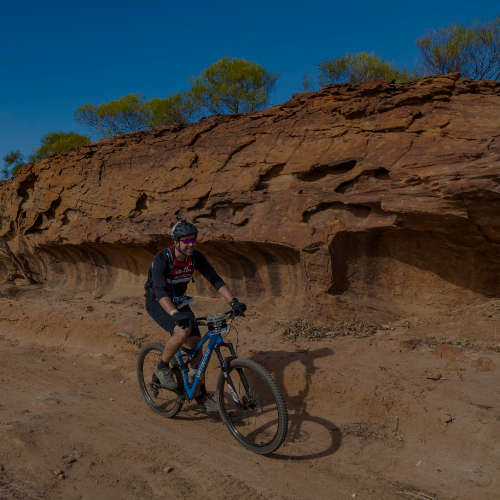 Race hard, or cruise, the sweet Marrinup Loop, or add extra trails to make the experience more of a challenge. Use this event to explore the varieties of terrain and vegetation that this region is famous for, you won’t be disappointed. The Marrinup Loop provides creates an awesome course for beginners and juniors with lots of fun without the technical challenges of the longer courses. More adventurous riders looking for a little more adventure might opt to undertake the Enduro event, a longer distance with more technical sections to negotiate but this course should be achievable for beginners that are really up for a challenge. 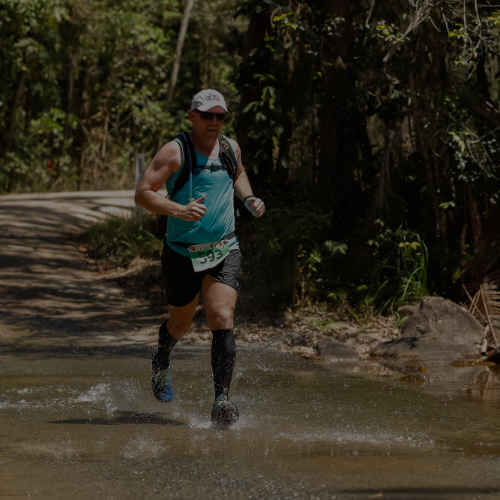 For the real adventurer, and most fun, the Ultra is your option; a long cross country course with lots of fun sections interspersed with some technical challenges. The Ultra course starts at race HQ and circulates out through sections of the Marinnup Loop before diverging to head towards the Turners Hill mountain bike trails. This section forms a second loop utilising a variety of tracks before returning to the finish at race HQ. This course has some technical sections to challenge riders and a variety of scenery keep the ride interesting as you clock up the kilometres. The Enduro course starts at race HQ and circulates out through sections of the Marinnup Loop before diverging to in the direction of Turners Hill to incorporate some additional trails and challenges. The additional section forms a loop around a variety of tracks to return the riders to finish line at race HQ. This course has some technical sections to challenge riders and a variety of scenery keep the ride interesting as you clock up the kilometres. The Taste/Junior course starts at race HQ and circulates around the beginner/family friendly Marinnup Loop. This course lacks the technical challenges of the longer options so is an ideal first-timers and junior course with a variety of scenery keep the ride interesting as you circulate back to the finish line. Whether you go ‘flat out’ or make this a leisurely ride to enjoy the location, we are sure you will have great fun on this course. A great course for a family challenge or to ‘take on’ your friends in good spirited rivalry. Adventurethon Demolish has 3 different stages for you to choose from, RUN; RIDE; PADDLE. All races will be in the Dwellingup region over the weekend of 25th & 26th May 2019. We have allowed sufficient time between races to allow you to easily transfer between race locations if you wish to compete in all 3 stages (Ultimate Demolish) or to spectate and see what great fun the competitors are having in the other disciplines. Dwellingup is located some 105 km south of Perth and 108 km north of Bunbury.